Brought up in the the West Midlands, England, my childhood experiences were of soccer, cricket and golf. Aged sixteen, I entered the world of the gym. In 2006, I graduated in Sport Development and Physical Education from Liverpool John Moores University. That same year, I discovered the mountains. I fell in love with the lifestyle, spending multiple winter seasons in the French and Austrian Alps working as a ski guide and host. My love of skiing led me me to Banff, Alberta, in 2011 where I qualified as a Level 1 Ski and Snowboard Instructor. Here, I realised that Canada was my new home. Returning to the UK in 2012, I qualified as a Personal Trainer and embarked on my first job as a trainer in Rhodes, Greece, where I ran the fitness department for a 5 star hotel. Canada called and I moved to Whistler in 2013. 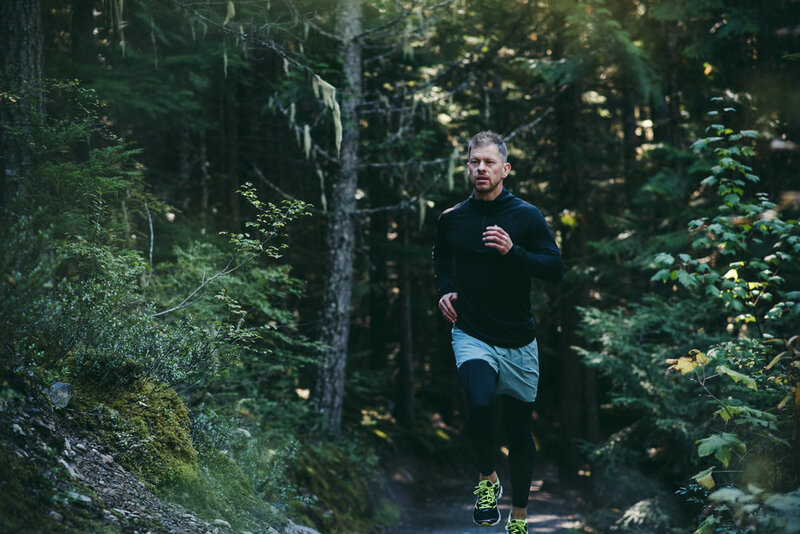 In the heart of Whistler Village, for 4 years, I led high intensity strength and conditioning classes and delivered personal training at The Core. I rocked up to Whistler a seasoned skier, gym rat and carnivore; driven purely by aesthetics. But living in this beautiful place, my entire philosophy for training and life began to evolve. The bicep curls were left behind as I transformed into a backcountry skier, trail runner, mountain biker, triathlete and vegan. I adapted my training style to mountain specific strength and conditioning. The beauty of this training methodology is that it is purpose driven, preparing you to be strong and fit for your mountain sport, the by-product is that you look great as well. Then came yoga. My ambassadorship with Lululemon opened my eyes to the benefits of this mindful practice. The ancient postures enriched my life, so much so that I felt compelled to learn to teach in order to share. It has lifted me in so many ways and I now endeavour to bring yoga into as many lives as I can. Whistler introduced me to racing. Competing in a handful of half marathons uncovered an unknown talent. Deciding the road was not for me, instead I began competing in trail running races along the Sea to Sky Corridor. Comfortably Numb and Valley to Peak, to name a couple, tested my endurance and mental fitness but, most importantly, introduced me to an amazing community of people dedicated to bettering themselves whilst playing in nature. It is in our nature as human beings to strive for more. Ironman is a flagship event in Whistler's calendar and seeing the pain and suffering on the athletes’ faces planted a seed in my mind. Could I have the mental fortitude to endure a 3.8km swim, 180km bike and 42km run? I had to find out. July 30th 2017, I crossed the finishing line after enduring 11.28 hours of horrendous yet wonderful torture (20 minutes wasted on a flat tire, couldn’t leave that out!). The support from the crowds, Whistlerites especially, was incredibly heart warming and helped carry me along. The year-long journey of training for this lofty goal was enlightening. The day itself was incredible, now a memory and accomplishment that will stay with me forever. However, the challenge I sought became an ordeal, a solitary mission of boredom and fatigue. I came to realise that I am fundamentally a social person who enjoys the support and interaction of others most. I crave connection and community. Ironman inspired me to create RICHLIFE, a program that enables people to reap the benefits of working out and connecting as a collective group.